feeling better now | doberman pizza. Yay! I went to the doctor’s office yesterday and, lo and behold, she diagnosed a respiratory infection, and prescribed antibiotics. She also suggested I get a good cough syrup. Wow. Why didn’t I think of that? You know, I love Bahá’u’lláh. When He says you should seek the advice of a competent physician, He knows what He’s talking about. So, yeah. Things are much better now. 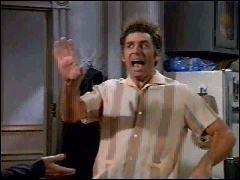 I can breathe; just got paid for my work on the cranberry site; and I don’t look like Kramer. Oh yeah, I forgot to mention I got a haircut today, too. My hair was getting a little bit long. I went to this basement hair salon I’ve never been to before and got a pretty good cut. The hairdresser was nice, and apparently her sister was the coordinator for the World Youth Day celebrations in the area. Neat! It’s amazing how many connections you can make when you just open up to people. That World Youth Day celebration was really something else. The experience has stirred up all these ideas, opened up so many doors, and really widened my understanding of the relationship between the different religions. It’s all so clear, and so powerful! There is no difference between a Christian, a Muslim, a Buddhist, a Bahá’í. As long as they are true followers, as long as they cut through the veils imposed by the limitations of human expression, and reach out to grasp the essence of the spiritual teachings of the Manifestations of God — rather than being contented with the material elements of religion, which must needs change — they are the followers of the One True God. Throw aside the veils, O people, which stand between you and the Beloved! Ya Bahá’ul-‘Abhá! Wow I feel good. If you feel like this too, for goodness’s sake, email me and let’s go travel teach! PS: “Ya Bahá’ul-‘Abhá” means “O Thou Glory of the All-Glorious”. It’s referred to as the Greatest Name of God. This entry was posted in baha'i blog, journal, pioneering in québec and tagged health, interfaith, pioneering, quebec, unity by danger. Bookmark the permalink.